• Retired Legendary News Anchor Diana Lewis Named Women’s History Month “Living Legend.” • Outstanding Women Achievers in Competitive Fields Selected. • Honorees are Exceptional Role Models of What a Woman Can Do. Detroit, MI, January 26, 2017 (Newswire.com) – ​​​​​​​​​​​The Career Mastered Awards Class of 2017 will be honored during the 3rd Annual Michigan Women’s History Month Leadership in Action Awards Dinner on Wednesday, March 1, 2017 at The Henry Autograph Collection Hotel in Dearborn, Michigan. 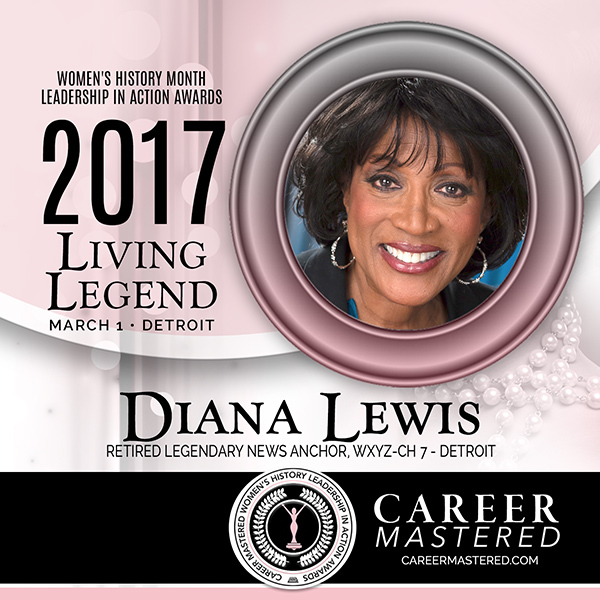 Retired Legendary News Anchor Diana Lewis has been named Women’s History Month Career Mastered “Living Legend.” The Awards Dinner is the highlight of Michigan’s Women’s History Month calendar, routinely attracting a sellout crowd. Linwick & Associates, LLC in conjunction with Honorary Co-Chairs Florine Mark, President & CEO of The WW Group, Inc. and Pam Rodgers, Owner and President, Rodgers Chevrolet, and sponsors will honor the achievements of women who have made a compelling mark on business. Honorees represent powerful women across diverse industries and disciplines. These women leaders are Trailblazers who have mastered their work and have learned the necessary steps to move ahead and build successful careers. The honorees are exceptionally strong role models of what a woman can do. Pranadhi Koradia, Chief Operating Officer, Transphere, Inc.
Career Mastered is growing global women’s business collaborative. It is the only platform of its kind that combines women’s history, leadership recognition awards, networking, talent access, and youth development to accelerate women’s careers while making a positive difference and impact on the global business environment. The goal is to make a powerful difference in women’s leadership aspirations while supporting future generations. Career Mastered presents the leading Women’s History Month Awards in North Carolina and Michigan, honoring today’s women leaders who are Game Changers, who take charge of their careers and their futures. The Award honors amazing women who have made a compelling mark on business and are exceptionally strong role models of what a woman can do. Founded in 2015 by Linwick & Associates, LLC. Career Mastered Awards celebrates and acknowledges the victories, challenges, and stories of the women who have helped to make our country what it is today. Proceeds are donated to Excel Village Center for Learning www.excelvillage.org.